The actual rifle requirements for accuracy were .35 MOA from a machine rest and according to Major John Mende (ret.) this accuracy had to be maintained to 10,000 rounds. He stated, “Interesting side note was there was a 10,000 round requirement for the barrel to maintain the original accuracy. In fact after some 10,000 round tests we discovered the accuracy improved. A few barrels were tested past 20,000 and accuracy never went below the original accuracy requirement.” I would have to say that is very impressive! The US Army barrel life states 5000 rounds and that sounds like they are being conservative. Based off of the experience I have, the rifles do shoot quite well if the shooter does his part. Apparently there were several other rifle makers who said they could build a better rifle for the required price, but they were not interested once they heard it would be 10,000 rifles and that they would be required to provide maintenance on those rifles for at least 5 years and with an Army option for 2 additional procurements. Remington was able to do it. This is the one that I have a lot of experience with. 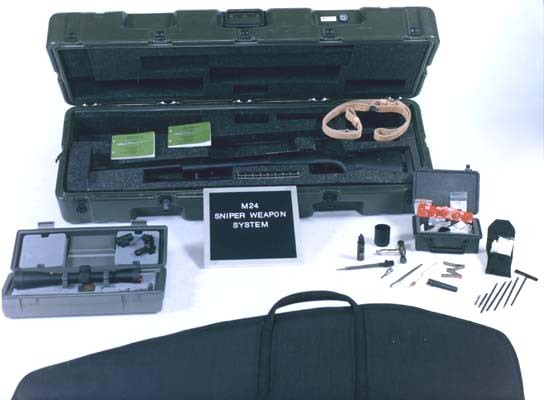 I have used the M24 SWS extensively while a sniper in the US Army National Guard and find the rifle to be of very good quality. The entire system as a whole is very functional. I do NOT like the fact that it has a long action (even if it is adaptable to .300 Win), it causes feeding problems with the M118 & M118LR (7.62x51mm) if the rounds are not pushed all the way to the rear of the magazine. Throughout all of my use of this system, I have consistently maintained 1 MOA with M118 special ball (Pre M118LR), which is saying a lot. The M118LR (175gr BTHP) performs considerably better and shoots about .5 MOA in the M24. I whole-heartedly believe that we have one of the best sniping SYSTEMS in the world. Above is a nice 100m group shot with ‘KATE’, one of my issued M24 SWS’s when in the Guard, during a laser-filter rezero using standard M118 Special Ball. While sub .5 MOA groups like this are uncommon with M118, it shows the excellent accuracy potential of the M24. M118LR does produce more groups along these lines than we would see with M118. Also pictured above is an excellent 500 yard group we shot while training with the local police department SWAT snipers. 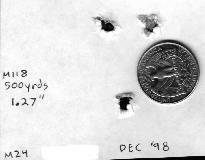 This was shot using standard M118 Special Ball, which attests to the excellent accuracy potential of the M24 SWS at long range. That is a .254 MOA group for those of you who are wondering. The M24 & M118LR combination has proven itself very effective during OIF and Afghanistan. There have been kills made beyond 1100 meters, though those are not standard fair. But under 800 meters the system has proven everything that was hoped for. The US Army has accepted a new sniper rifle known as the XM110 which is a 308 semi auto built by Knights Armament. It is unclear whether this rifle is intended to replace the M24 or not, as there have been conflicting reports. One thing is clear, the field reports on the M24 have been very good and there was a strong outpouring of support for the M24 from field snipers when news of the XM110 was spread. A second contract for the M24 was issued to Remington around 2001 (give or take a year) for some more systems with some minor changes. These changes included two piece Leupold mk4 bases instead of the one piece on the first series rifles, and a switch from Redfield international palma aux sights to another manufacturer (perhaps OK Webber?). Redfield was out of business by then, so a change had to happen. One important thing that happened when Remington redid this contract, and that was that there was no exclusion clause and Remington was and is now able to sell the M24 to others without US Army approval. So, the M24 can now be purchased by Law Enforcement agencies, and even civilians. They are expensive, but they are available. It is also worth noting that in the 1990’s, Israel purchased and used M24’s. I believe they are still in Israeli use today. You bet, just send me an email or use the contact form and let me know what information you are looking for. 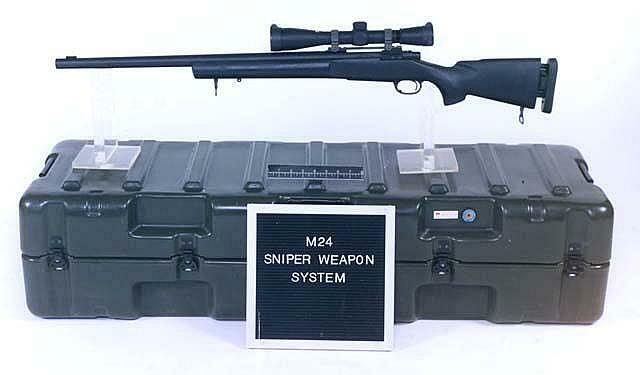 The M24 SWS is available to purchase from Remington and they usually sell for about $9000 USD for the complete kit. They are an excellent rifle but do have their flaws. The buttstocks usually need to be built up so a proper cheek weld can be established and the adjustable length of pull usually slowly moves. But they are very accurate and durable. No, not really. The M40’s were (and are) custom built by USMC gunsmiths. They completely rebuild the rifles and as such the quality and performance is beyond a factory Remington 700P. Doesn’t mean the 700Ps are not good, but they are not custom built either. What are the fixed sights used on the M24? I understand there were two different manufactures. Interested in a M24. Are civilians authorized to purchase/own one? I’m very serious about personal protection in a survival situation. Could I get info please? Yes, the M24’s are available on the market, but they can be hard to find. Run about $8000 for the complete package. Does it have a bull barrel. What dimension is the barrel ? How thick is it ? I Love this rifle! I have a 700p that is very accurate but I wish that thy made them with the M24 contour barrels rather than the varmint contour. I know that Stocky’s sells M24 contour barrels with 5R rifling. If I purchase an HS precision M24 stock, the Rock Creek M24 barrel, a Timney 510, Oberndorf steel floor plate, and Badger Ordnance recoil lug, Mark 4 rings, and the flat one piece Badger Ordnance M24 base, and finally the Leupold 10x M3A Ultra Scope can you guys put it together for me? I think that the barrels have to be crowned and threaded. But you guys have Remington 700 long actions already for the SC rifle builds correct? I’m wondering if I can purchase an SC rifle build from you guys with a Remington 700 long action, send you this stuff above and get an awesome M24 clone? Is this possible? The sendero is a solid rifle and they tend to shoot pretty well out of the box. Accuracy should be in the .5-1.0 MOA range with match ammo. If you find a load it likes, it may be sub .5 MOA. The HS stock is good, though a more traditional stock design than modern tactical rifles, but it certainly still works. I was wondering about the m24 trigger as I’m seeing them refurbished by Remington and for sell now. How does this trigger stack up against the other aftermarket Remington trigger upgrades available? I’ve got a Remington 40x . Is there alot of difference between the two triggers? The M24 is still the main sniper rifle of the IDF and they are very pleased with it. 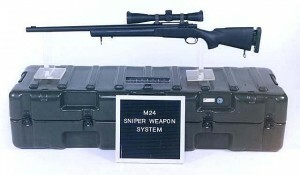 Other sniper rifles include the Barak 338 (upgraded HS Precision Pro 2000 HTR), SR-25, Barrett M82A1 and in special forces: McMillan TAC-338 and TAC-50. So, I’ve just purchased a new M24R SWS rifle. I want to know what sort of accuracy I can expect from using LCAAP XM-118LR? What can I realistically expect to see from this ammo at 600y for long term testing. I really want to do some long term testing. So, I plan on purchasing 500rnds and testing it over a 6 month period at ranges from 100-600y possible even 1000y– if I can find the correct range. I want to see exactly what a mil-spec rifle like this capable of doing. Right now, I’ve got a Leupold Mark 4 M1 TMR 8.5-25x 50mm mounted on it. However, for longer range work, I plan on putting a Vortex Razor HD Gen II 4.5-27x 56mm MRAD-1C scope on it. So, if you any advice on how to get the most out of a M24 SWS email me. It would be great to get some pointers form a person with a lot of trigger time behind it. The remington 40x trigger I told you about arrived to me damaged. It was an individual seller. Are m24 triggers available to buy? I’m interested in a Remington 700, .308. So far, the the 700 5R and the M24 are what I have my eye on. Are they the same just one says M24? In 1986, my Army unit’s sniper squad had black stocked bolt action rifles. When my roommate graduated USMC Scout Sniper school, they “rewarded” him with a new “brown stock” rifle which I thought was ugly. I didn’t know much about bolt actions back then, but I would’ve recognized an M21. Do you know of any bolt action rifles that preceded the M24? I thought perhaps they were USMC run-outs. Our unit had just been activated and we were only one battalion at the time (10th Mountain at Ft. Benning). I was just curious because when I mention this to people, they insist it must’ve M21s. No, there were no other officially adopted rifles between the M21 and M24. The M24 was the rifle that replaced the M21. But the individual unit could have gotten approval for a purchase for use within its own unit. The 10th has always been light and they could have known the need for snipers with light infantry and moved their own program forward. That is not .25″ MOA at 500 yards. It’s clearly more than 1″ MOA at 500 yards. Which is still outstanding, but, still makes me wonder why he would say otherwise. Actually, 1 MOA at 500 yards is equal to 5.235″, remembering that the rough calculation is 1″ at 100 yards, 2″ at 200 yards, 3″ at 300 yards, etc. So this 1″ group at 500 yards is equal to 0.191 MOA, well under .25 MOA. The M24 seems to be a very accurate rifle. What is its common accuracy with M118LR and with match grade ammunition? Is it capable of consistent 0.25 MOA groups with match grade ammunition? No, .25 MOA is not a consistent result with M24s, but they are a solid .5 MOA rifle with match grade ammo and usually with M118LR as well. Very good rifles. Mel, In your experience are there any 308 Win rifles that shoot consistently <0.5MOA? There are a good number of custom built rifles that will do it, but for factory produced rifles, they are a bit less plentiful. I would say the Sako TRG-22/42 rifles, AI rifles, Remington M24s, and probably some others I’m forgetting as well. I can’t really list the USMC M40 series because they are custom built by their armorers, but they will certainly shoot that as well. I’m a police officer in Las Vegas. I acquired 4 M144 spotting scopes from a DOD program were in. 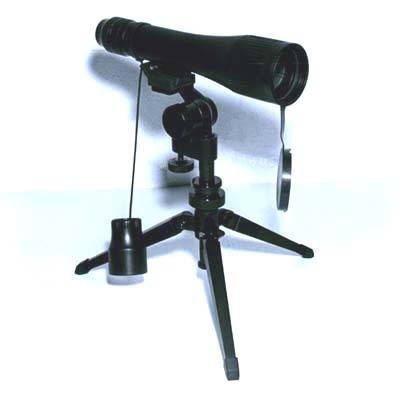 One of the tripods had a broken adjustment knob that swivels the scope up and down. I’m trying to locate parts for the tripod, but it’s difficult. Do you know of a resource I can contact? My agency might even buy a new or used tripod if one is available. Thank you for your time. My LGS has one of these M24s for sale at $2,200. It doesn’t come with any of the bells and whistles, just the rifle itself. No scope, no case, nothing. Just the rifle which has a nicely done woodland camouflage paint scheme. I like the price but I got to thinking that it might be possible to build an M24 pattern rifle (minus optics of course) for less than that and I would have a brand new, unfired rifle. Would that be possible to do without sacrificing the capabilities a regular M24 would have? Sorry if that’s a dumb question, I’m still kinda new to precision rifles but any information would be appreciated. You can certainly build a replica with most all the same parts, but I think you will be hard pressed to do it for under $2200, especially if you want it 100% accurate with the aux sight block up front, aux sight threading in back, 5R barrel, steel floorplate, etc. If you just want to get close, then you might be able to save a few bucks. I guess in that case I’d just buy the rifle if the cost savings are going to be minimal. Besides the paint job on it is pretty neat. Thanks for all your time sharing all of this information all the time. My question is about bases. I’m building a .308 and want a similar set up to what I used in the Army. Is Michael correct in his above post, did the 24’s come with Leupold two piece Mark 4, 0 MOA rails? It depends on the year the M24 was built. The original batch of them came with single piece Leupold Mk4 bases, but this was before they were a rail like they are now. They just had four slots, two up front, two toward the rear. If your M24 was from the second run of them… (err, I think those were built around the year 2000), then they had the two piece Mk4 bases as indicated. Hello, I have an M24 .308 LA, however since it is the long action I am missing the internal cartridge block. I can load 1 cartridge at a time and it loads great but if I try to load all 5 it won’t feed right. Does anyone know where I can find that part or what to do? Actually, there never was any sort of cartridge block on these. At sniper school they trained us to insure all of the rounds were pushed all the way back in the magazine when we loaded the mag. They feed well when loaded like that. I like the adjustable buttplate on the M24 H-S Stock. Do you know who the manufacturer is and if that item is available separately for purchase? If so, who may have them? HS Precision makes those stocks with the adjustable buttplate. The model is the PST-006 (Short Action) and PST-011 (Long Action). You can order them from us or even HS Precision directly. They have some other models with the same adjustable buttplate as well. The M24 was never chambered for the 30-06, but the early M1C/D and M1903A4 sniper rifles from WWII and Korea were chambered for .30-06. 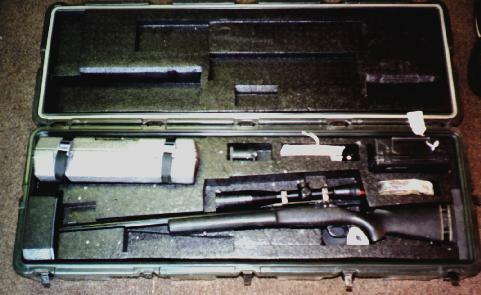 As well as some other non “official” sniper rifles such as the Winchester M70 that Carlos Hathcock used.